WBC World Champion Mairis Briedis (22-0, 18 KOs) and Mike Perez (22-2-1, 14 KOs) faced each other at a press conference in Riga ahead of Saturday’s Ali Trophy Quarter-Final clash at Arena Riga, Latvia. World Boxing Council (WBC) Cruiserweight World Champion Mairis Briedis (22-0, 18 KOs) risks his world title and undefeated record against Cuban-born challenger Mike “The Rebel” Perez (22-2-1, 14 KOs) this Saturday when the highly-competitive World Boxing Super Series (WBSS) tournament continues with more quarterfinals action, starting at 5 p.m. ET / 2 p.m. PT, to air live in Canada exclusively on Super Channel from Riga Arena in Riga, Latvia. 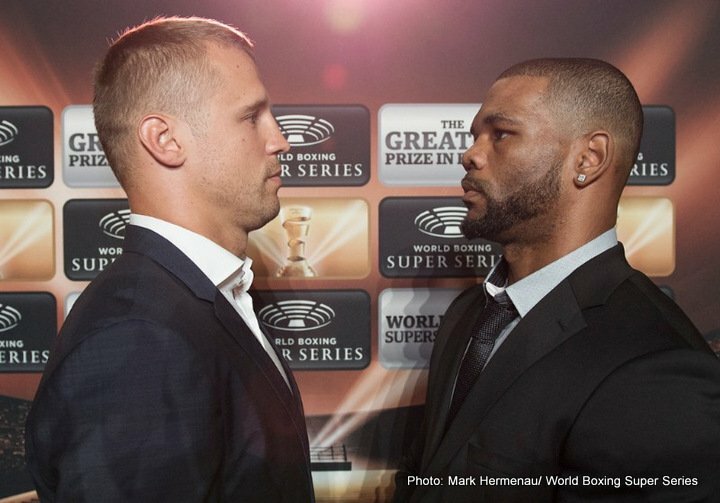 The “Briedis vs. Perez” card will give Canadian boxing fans another opportunity to watch world-class prize-fighters competing in the $50-million WBSS tournament, live from Latvia, exclusively on Super Channel, which acquired the rights in Canada to broadcast the World Boxing Super Series from MP & Silva, a leading international media company that provides media rights, digital, technology and sponsorship services. The 32-year-old Briedis, who captured the WBC cruiserweight world title in his most recent fight, taking a 12-round unanimous decision from former world champion Marco “Capt’n” Huck (40-3-1) last April in Germany. A former European kickboxing champion, Briedis will have a distinct advantage fighting Perez at home in Riga, Latvia. “I’m real happy being able to start the World Boxing Super Series at home in front of my own crowd,” Briedis said. “We fight to win the Muhammad Ali Trophy, but I am also putting my world title at stake. This is a big thing. For Latvia, this will be the first major world championship bout in history, so I hope to see a sold-out arena. “From my previous experience with the Latvian crowd, I can really tell Mike Perez that boxing in front of a Riga crowd will not be easy for him. The boxing community around the world will learn how passionate and loud Latvia fans can be! My preparation camp has been going very well so far and I can assure my fans that I’ll be at my best when the 30th of September arrives. Based in Cork, Ireland, where he defected to from Cuba, Perez will be fighting as a cruiserweight for only the second time having campaigned for most of his 9 ½-year pro career as a heavyweight. The 31-year-old southpaw doesn’t fear fighting Briedis in his backyard and he remains confident. “It’s an opportunity of a lifetime,” Perez remarked. “Fighting in Latvia isn’t an issue for me. I don’t care where I fight. I’ll fight anywhere. I feel good, I’m confident, and I’m looking forward to Riga. I have a chance to become world champion in my very first fight in the tournament, so I couldn’t have asked for better. The “Briedis vs. Perez” winner will advance to the semifinals to face the WBSS No. 1 seed, undefeated World Boxing Organization (WBO) cruiserweight champion Oleksandr “The Cat” Usyk (13-0, 11 KOs), who stopped Huck in the 10th round of their WBSS quarterfinals fights this past Sept. 9 in Berlin. Four exciting bouts on the “Briedis vs. Perez” card, promoted by Sauerland Event, will air in Canada exclusively on Super Channel. In the co-featured event, former WBO Cruiiserweight World Champion Krzysztof Glowacki (27-1, 17 KOs), the dangerous Pole who ironically lost his title belt to Usyk a year ago, is slated to face Leonardo Damian Bruzzese (18-3, 6 KOs), of Italy by way of Argentina, in a 10-round WBSS Cruiserweight Substitute Fight. Also airing live on Super Channel is a 10-round light heavyweight match between Norwegian Tim Robin (16-3, 9 KOs) and Sergey Gorokhov (8-2, 6 KOs), of Russia. The televised opener finds 2016 Olympic bronze medalist Filip Hrgovic, of Serbia, making his debut against unbeaten Belgium heavyweight Ali Baghouz (10-0-1, 6 KOs) in an eight-round bout. Next boxing news: Anthony Joshua, Deontay Wilder seemingly on a collision course – but where will it rank alongside the last great heavyweight fights?